Salvador Dalí made paintings, sculptures and films about the dreams he had. He painted melting clocks and floating eyes, clouds that look like faces and rocks that look like bodies. Sounds weird right? Think about what your paintings would look like if you painted your dreams? I bet they would be pretty weird too! Dalí was involved with surrealism. This was an art movement where painters made dream-like scenes and showed situations that would be bizarre or impossible in real life. Look at this painting above – does the lake look like a fish to you? This sculpture above is by another famous surrealist artist called René Magritte. I wonder why he has painted a head full of clouds? Surrealist artists were influenced by a famous psychoanalyst called Sigmund Freud. A psychoanalyst is a doctor who studies the human mind and tries to understand it. Freud believed our mind was divided into two parts: the conscious part and the unconscious part. The conscious mind is what we use to make decisions every day, like whether we walk or ride a bike to school. The unconscious mind is where our memories are stored. Most of the time we are not aware of our unconscious mind, but sometimes the memories stored there get mixed up in our dreams and this is what Dalí tried to paint. Dalí was born in 1904 in Figueres, Spain which is near the Pyrenees Mountains. Surrounded by this landscape as he was growing up, Dalí often included the scenery he saw as a boy in his paintings. Look at the painting above. Can you see the Spanish landscape in the background? The hand holding the egg mirrors the man sitting in the water. There are a lot of odd things going on in the background that don't seem to be connected. What else can you see? You can always recognise him because he has a funny moustache. He liked to dress in crazy clothes and have long hair which people found very shocking at the time. Dalí was even expelled from art school just before his final exams because he said that none of the teachers were qualified to examine him. Cheeky! Salvador Dalí went to Paris after leaving art school, which was where he met the surrealists. The surrealists appealed to his wild sense of humour, they invented surrealist games and enjoyed putting different objects together to make something playful and disturbing at the same time. Here is Dalí's version of a surrealist sculpture. It is called Lobster Telephone. You couldn't call anything on that! What two objects would you put together to create a surreal sculpture? In 1936 the Spanish Civil War broke out and Dalí was greatly affected by it. This is a painting Dalí made about the war. The background is mainly brown, yellow and black, representing the Spanish landscape. The strange forms in the foreground represent a man and a woman. It's pretty gross, but they are eating bits of each other's flesh with a knife, a fork and a spoon. Dalí uses this shocking idea to say something very powerful and important. He is saying that by fighting, the Spanish people are destroying their country and each other. When Dalí was in Paris he also made a film with the director Luis Buñuel called Un Chien Andalou (An Andalusian Dog). 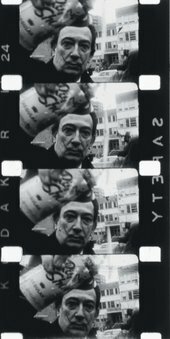 It was the first surrealist film and had no plot, just a series of scenes that only slightly link together. 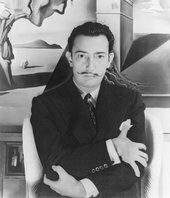 Later, Dalí went to Hollywood and worked on other films with famous directors like Alfred Hitchcock and Walt Disney. Dalí liked to use lots of different materials to make art, including paint, sculpture and film. He even designed furniture, jewels and scenery for theatre production. He was a man of many talents and he is still seen as a great artist who influences many artists today! What do you think of Dalí's artwork? Is it funny, weird...scary?